I was contacted by Keith and Dana of KD Meteorite about making meteorite damascus knives but, since I tend to like doing things a bit different, we talked about taking meteorite shavings and mixing those with powdered steel for a new affect and a fully functional knife blade as opposed to a "decorative" (ugh!) piece. These knives came out great after testing and the "cool" factor is certainly there, plus we are coming up with more ideas/patterns constantly. If you have an interest in a knife who's soul came from outer space to be used on Earth, keep looking here, we're going to be doing some wild stuff. For more information and availability on these and more of our meteorite collaborations go to... KD Meteorites. 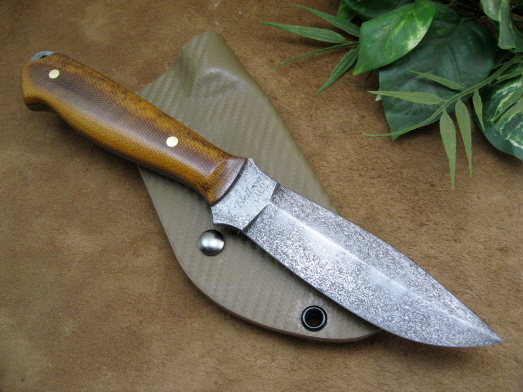 This San Mai Bowie is a true original! 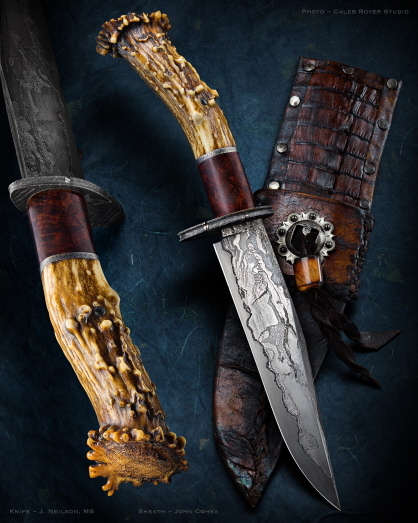 The 7" blade is forged with 1095 high carbon steel core sandwiched by canister damascus made from pieces of Muonionalusta, Odessa and Seymchan meteorite in a matrix of Gibeon meteorite shavings and 1095 high carbon steel powder with forge marked and acid soaked flats. Approx. 1 3/8" wide. The fullered oval guard is a solid pieces of Seymchan meteorite. 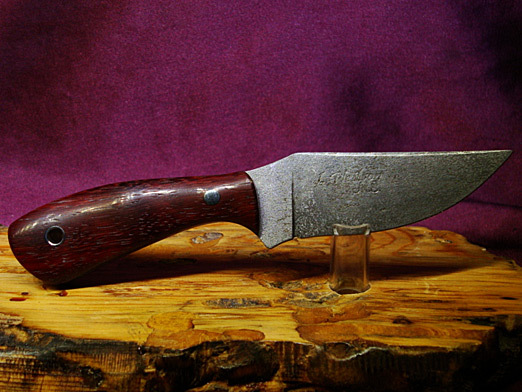 The handle itself is a Presentation grade Stag crown with a throat of Desert Ironwood Burl. The handle pieces are separated by a hand-hammered and etched carbon steel spacer and everything is secured with a matching set pin. The overall length of this piece is 12 1/2" and it comes with a rawhide sheath by John Cohea that includes exotic inlays, iron tacks, lacing and fob, etc. This Hunter/Dagger Cross is forged from Gibeon-T Meteorite shavings and 1095 high carbon steel powder done in my canister weld. The blade is double ground and features Natural Canvas Micarta handle scales sandwiching the full-tang design. The scales are secured with brass handle bolts and feature an exposed lanyard hole/pommel. This knife comes with a tan Kydex belt sheath with removable/reversable belt loop. This "Bits & Pieces" Simple Swift Belt knife is forged from Gibeon Meteorite shavings and 1095 high carbon steel powder mixed with actual Gibeon Meteorite pieces done in a canister weld. This full-tang knife has handle scales of A-grade Sambar Stag secured with a stainless steel pin and lanyard liner worked to match the Stag.This knife is 6 1/4" oal with a 3 3/8" blade and comes with a tooled leather pouch sheath with a belt loop. This Neck/Pocket knife has a full-tang blade forged from Gibeon-T meteorite shavings and 1095 high carbon powdered steel done in a canister weld. The removable handle scales are digital pattern Kydex secured with Chicago screws and have an exposed lanyard hole/pommel. The sheath is made of matching Kydex with a ball-chain for neck wear or you can remove the chain and keep the knife in your pocket or pack. This classic Bowie design is forged from Glorieta Mountain shavings and 1095 high carbon powdered steel done in my canister weld. This full-tang knife is sandwiched with handle scales of A-grade Desert Ironwood Burl with a "coffin" profile and with a "palm swell". The scales are secured with stainless steel handle bolts and a matching lanyard liner. This knife is 11" overall and has a 6 1/2" blades and also comes with a tooled leather sheath with a belt loop and retention strap. This full-tang Drop-point knife has a contoured profile and a body forged from Gibeon-T meteorite shavings and 1095 high carbon powdered steel done in a canister weld. The handle scales on this knife are black linen Micarta and set with stainless steel handle bolts with an exposed lanyard hole and pommel. 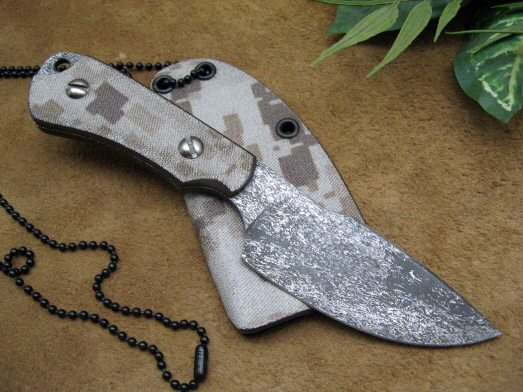 This knife also comes with a matching black Kydex sheath with removable reversible belt loop. This Bowie has a fully quenched damascus blade of Gibeon Meteorite shavings and powdered 1095 high carbon steel forged in a canister weld. The contoured guard is made of matching damascus and has a stainless steel set pin. 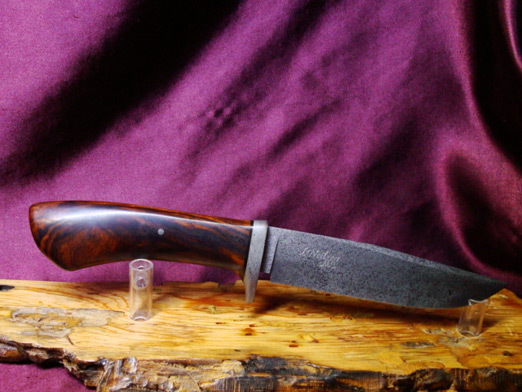 The handle is made from A-grade Desert Ironwood handle with a black spacer. This knife has a blade that is 5 1/2" with an overall length of 10 1/2" and comes with a tooled leather blade sheath with a belt loop and retention strap. This Clip-point Hunter has a fully-quenched damascus blade of Gibeon Meteorite shavings and powdered 1095 high carbon steel done in a canister weld. 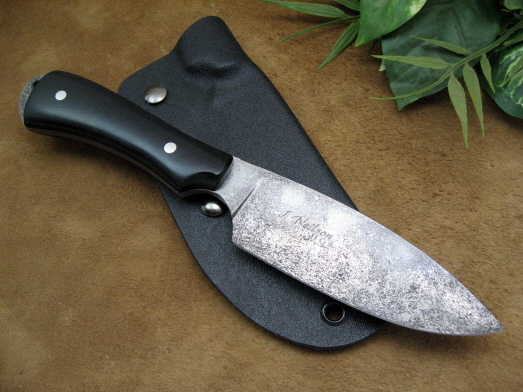 The contoured guard is made of Seymchan Meteorite and has an etched carbon steel set pin. 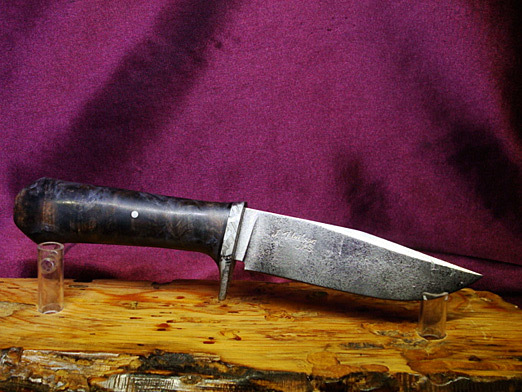 The handle is made from stabilized/dyed A-grade Maple Burl wood with a black spacer done in a "coffin" profile. The blade on this Hunter is 4 1/2" with an overall length of 9" and this knife comes with a tooled leather blade sheath with a belt loop and retention strap. This full-tang Belt/Utility knife has a fully-quenched damascus blade of Gibeon Meteorite shavings and powdered 1095 high carbon steel forged in a canister weld. This knife's handle scales are A-grade Red Padauk and are secured with a combination stainless steel pin and lanyard liner. This piece has a 3 1/4" cutting edge and an overall length of 6 3/8" and comes with a tooled leather pouch sheath with belt loop. 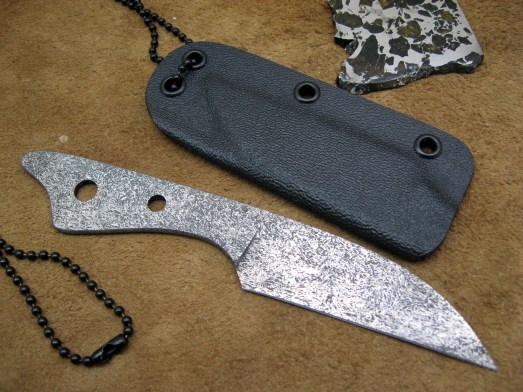 This Wharny-style Neck/Keychain knife is fully-quenched damascus forged from Gibeon Meteorite shavings and powdered 1095 high carbon steel forged in a canister weld. The handle is "skeletonized" with holes for a lanyard, lashing, etc. This Necker design comes with an overall length of 5 1/4" with a 2 3/8" cutting edge and comes with a molded black Kydex neck/keychain/pocket sheath with ball-chain.